"Don't you love one-pot recipes? I love making them. As much as I love to cook, not having a big mess makes me very happy. The curry blend smelled so good and the haddock took on the flavors perfectly! Thanks again, City Fish! This is also a 30-minute meal and a paleo dish! Keep it healthy..."
Heat olive oil in a large pot until very hot. Add haddock; cook until browned, about 3 minutes per side. Add red bell pepper, shallot, and garlic; cook and stir until shallot softens, about 3 minutes. Pour coconut milk into the pot. Whisk in curry paste, curry powder, coriander, and turmeric. 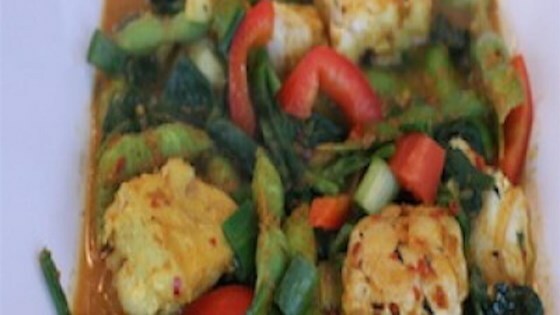 Reduce heat; simmer until coconut milk is reduced by 1/4, 6 to 7 minutes. Stir in spinach and edamame. Cook until spinach is wilted and edamame is heated through, 3 to 4 minutes. Sprinkle green onions over curry. Substitute coconut oil for the olive oil if preferred. Frozen edamame are fine to use. Really good flavour, seasoning pairs well with the haddock.